It wasn't exactly fake news, but it was damaging anyway. 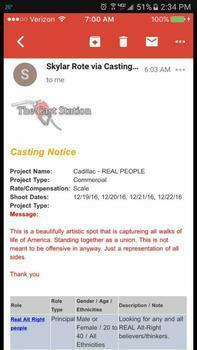 A phony casting call claimed to be recruiting "Alt-Right believers/thinkers" for a Cadillac commercial. "This is a beautifully artistic spot that is captureing [sic] all walks of life of America Standing together as a union," the notice read. 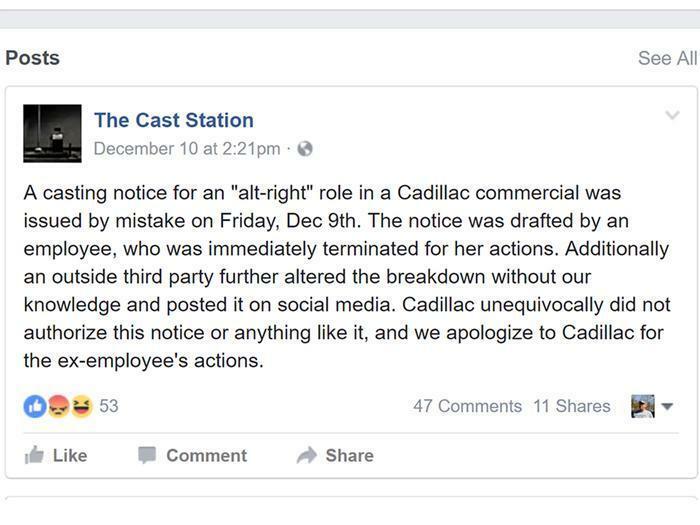 Cadillac disavowed the notice after it started getting negative blowback on social media. "Cadillac did not authorize or approve a casting notice for an 'alt-right (neo-nazi)' role in a commercial. We unequivocally condemn the notice and are seeking immediate answers from our creative agency, production company and any casting companies involved," Cadillac stated on its Facebook page. Responsibility appears to lie with a casting service called The Cast Station, which issued an apology on its Facebook page. Cadillac has been trying to position itself as a progressive brand targeting younger consumers, recently adopting a marketing campaign called "Dare Greatly," which features just about everything except pictures of its cars.